With dozens of high pressure swivels for choke & kill, mud boost and hydraulic lines in service without any failures, it’s time to let the world know we have a fully vetted and reliable product that is giving our customers peace of mind. Low Torque 360 degree rotation under full system pressure, reliability under extreme offshore conditions and field serviceability were the drivers of our robust Heavy Duty High Pressure Swivel design. Pressure pulsations, extreme axial and lateral loading caused by the swinging and flexing of high pressure drape hoses will cause inferior swivels to fail creating critical system pressure loses and significant non-productive time events. 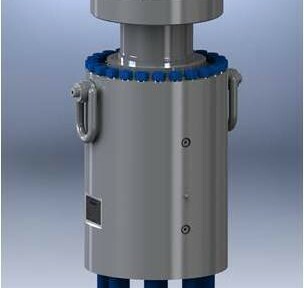 The Subsea Company swivel design utilizes heavy duty name brand roller bearings to handle the extreme axial and lateral loading typically found during offshore drilling operations. Using our High Pressure Swivels for all your under pressure swivel requirements and to position hoses for flange alignment during make up saves time and money.